A taproom and keg-only favorite will soon head to 16oz cans and by March 2012 Oskar Blues will deliver their Oskar Blues Deviant Dale's IPA to the masses. I was lucky enough to be sent a hand-canned unlabeled sample of this bold dry-hopped American IPA monster to get a sneak preview of what Deviant Dale's will taste like out of the can. Deviant Dale's is already an award winning beer even before it goes to the canning line. 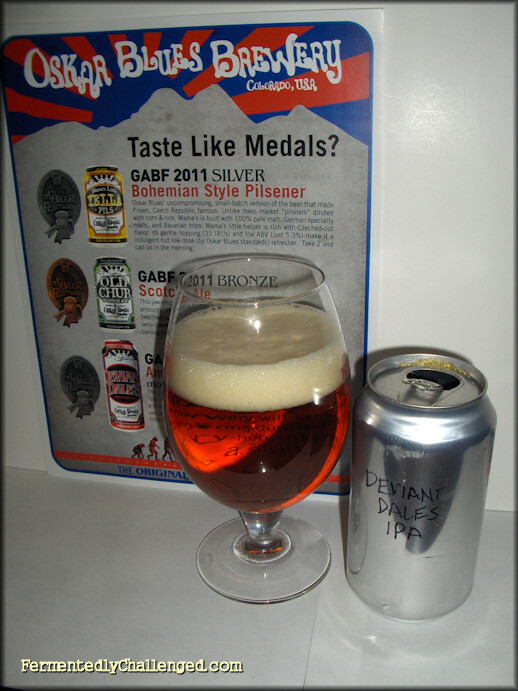 In 2011, Deviant Dale's IPA won a Silver Medal at the Great American Beer Festival in a very crowded beer style category. It's also been on select taps around Colorado for a while as well. Now, this beer will become Oskar Blues' first beer to be packaged in a 16oz tallboy can off of their brand new expansion canning line. As per usual, this beer wasn't designed to be a light-weight. It weighed in at a powerful 8.0% ABV and probably has an IBU rating off the charts. It was hopped 4 times during the brewing process and then dry hopped further with Columbus hops. These hops had a very high alpha-acid percentage (14-18%) which was designed to give a clean but long-lasting bitterness to a beer. So given Oskar Blues' reputation for big bold beers, I was anxious to give this one a try. Appearance:Out of the can, Oskar Blues Deviant Dale's IPA poured a bright copper-orange color with a nice 2-finger tall off-white tight bubbled head. The beer had remarkable clarity in the glass. No haze, even when very cold. The head left a nice clingy lacing on the edge of the glass as well. The head when swirled looked rather creamy. Aroma: Deviant Dale's had a very remarkable aroma. It was abundant with dry-hopped Columbus hops - very earthy, somewhat resiny, yet fresh too. Even closing my eyes I could tell this beer was definitely a hoppy IPA. These hops are the same (supposedly) as the ones they used in Russian River's Pliny the Elder. It's was almost like smelling a handful of fresh picked resiny hops in my hand. Taste: Knowing Oskar Blues' reputation for big bold beers, I was ready to be hit with a lot up front and I wasn't disappointed. Deviant Dale's has a strong resiny hop flavor mixed with a full bodied malt blend behind it. It's noticeably bitter, as a dry-hopped IPA should be. The texture is rather smooth going down, yet nearly sticky due to all the hops they packed in. With this much hop flavor and aroma, I half expected to see whole leaf hops in the bottom of the can. While some IPA's can be extremely dry and too bitter, this one delivered the hop slam without too much dryness or lack of maltiness. Overall: I was pleased with the balance of malt and hops in this beer even though I couldn't ever get away from the powerful aroma of the hops. Oskar Blues seems to have found a wonderful recipe for this 7th beer (or is it the 8th with HGH Part Duh) to head to the canning line. I'd rank this up with some of the best IPA's I've had like Dogfish Head's 90 Minute IPA. However you distinguish an American IPA from a regular IPA - Oskar Blues seems to have done it's trademark FUH-CAN-EH top job on this beer. I "can" hardly wait for this to be released in 16oz tallboys in March 2012. I suppose I should head down to Longmont or Lyons more often to get this on tap in the mean time. - Oskar Blues Mama's Little Yella Pils review. - Farm animals and more help Oskar Blues grown 40%. - Oskar Blues celebrating it's 9th CANiversary.